In a 1996 interview with Pipeline, The Falls Mark E. Smith said, It’s like listening to Pavement: it’s just The Fall in 1985, isn’t it? They haven’t got an original idea in their heads.” Now, thats a bit harsh and perhaps even slightly hyperbolic, especially if its solely based on the bands Matador output. Sure, there are influential elements in Pavements music, in particular 1992’s Slanted and Enchanted, and maybe in the immediate inaccessibility to 1995’s Wowee Zowee, that point towards The Fall; however, nothing to warrant such a statement as that. Had Mr. Smith been listening to Pavements music recorded from before their full-length debut, Slanted and Enchanted, his ire, though still based in ego and arrogance, is easier to comprehend. Prior to Pavement signing with Matador and releasing Slanted and Enchanted the band recorded three EPs: Slay Tracks (1933-1969), released on the bands own Treble Kicker label in 1989, Demolition Plot J-7, and Perfect Sound Forever, both released in 1990 through Drag City. With the success of S&E on Matador Records, Drag City compiled the bands first three EPs along with the Summer Babe single, My Radio from the Chemical Imbalance compilation, and My First Time, originally a flexidisc in the fanzine Ablaze!, releasing it under the title Westing (By Musket and Sextant). Preserving the integrity of the original EPs, Westing features all the songs in the same order with the first two EPs on Side A and the remaining recordings on the flip side. It was pretty exciting to be so experimental. Producer Gary Young became the de facto drummer (and eventual member) during the four-hour recording session, contributing rhythm on Box Elder and Price Yeah!, the former of which was covered by the Wedding Present on their 1990 EP Brassneck. The pop-like feel of Box Elder is almost 180 degrees from the opener and hints at the ironic, even sardonic tendencies (lyrically and musically) that will eventually make up a good portion of the bands catalog. During the making of Slay Tracks Pavement was Stephen Malkmus (SM) and Scott Kannberg (Spiral Stairs). After the EP was recorded and released, Malkmus left to tour Europe. Kannberg formed a new project, Pa, with drummer Jason Turner. 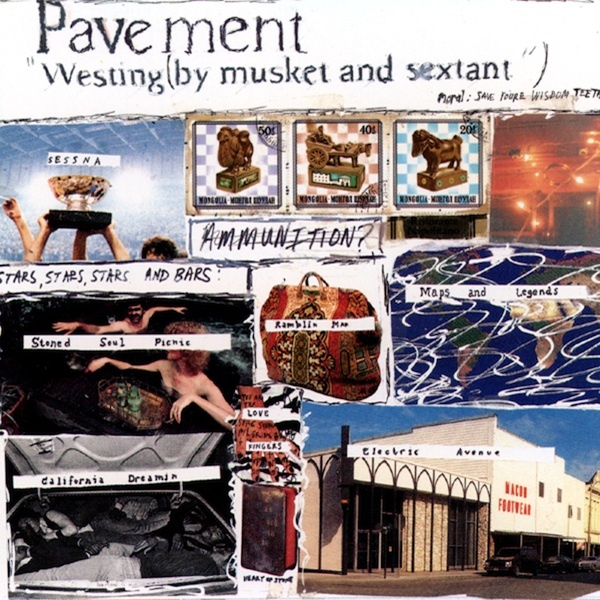 When Malkmus returned and heard the songs Turner and Kannberg had written it was decided to make it a Pavement project. The second EP, Demolition Plot J-7, was once again produced and recorded by Gary Young and shared many of the same sounds and influences found throughout the bands first EP. Tension, however, mounted during the recording sessions, as Young expressed jealousy and hostility towards Jason Turner, who in the end only drummed on one track, Forklift, with the remaining drumming performed by Malkmus and Kannberg. Opening track Forklift, once again is introduced through a layer of fuzz effects and shimmering guitar lines, with keyboards overdubbed in the chorus. Follow up number Spizzle Trunk features thrashy guitars and barroom pianos buried in the mix and comes off as an early, but punk-y, R.E.M. track that is ripe for a cover by a band such as Wavves or HEALTH. On Demolition the song that perhaps closest approaches what was to come from the band would be Internal K-Dart. In fact, reduce the over-saturated noise and you can hear what so many bands in the early ’90s co-opted. Pavements third EP, Perfect Sound Forever, continues to sport the bands lo-fi recording techniques and signature sound idiosyncrasies and, at times, may prove a more difficult and challenging listen than either of the first two EPs. Much of what is on Perfect comes across more as aural/sonic ideas and thought pieces rather than actual songs, such as Recorder Grot or Drive By Fader, and the opening instrumental Heckler Spray. Featuring a reverberating guitar ping, the song builds and builds only to abruptly end. However, the listener is immediately rewarded with From Now On, which begins nearly flush with the immediate ending of Heckler Spray, continuing to peak and build, only with a slightly different vibe. From Now On is one of those songs that can be almost immediately recognized as Pavement, even if your only exposure was via the Matador catalog. This song is the best example of the band migrating toward the Pavement of Slanted and Enchanted. Where From Now On echoes Pavement, Debris Slide sounds as if it was found on the cutting room floor from the Pixies’ Doolittle sessions. Complete with the rapid fire drumming and the ba ba ba da da Debris Slide! chorus, Black Francis and crew seemingly possessed Pavement for one minute and 56 seconds. Much like how the Watery, Domestic EP can be seen as a transition between Slanted and Enchanted and Crooked Rain, Crooked Rain, the first three EPs represented on Westing can be interpreted as an evolutionary sonic pathway to their eventual signature sound. With that said, the inclusion of the Summer Babe single and two other independently released singles feels out of place on this compilation. Where the first three EPs (tracks 1-18 on the compact disc) are collectively unified in their lo-fi aesthetic and sonic manipulations, the clean, focused sound of the Slanted and Enchanted single Summer Babe is grossly out of place. While the inclusion of the two one-off songs is appreciated, the exclusion of Summer Babe and its two B-sides wouldn’t necessarily be missed. Allmusics Stephen Thomas Erlewine described the music on Westing as defiantly anti-CD. While originally listening to the music, one can’t help but feel that the studio chicanery performed with the sonic manipulations beginning Slay Tracks could easily be lost on todays audience. What was obtuse experimentation in 1989 sadly comes off too similar to the sounds of digital artifacts and poorly compressed mp3s today. (To ensure myself what I was hearing was indeed real and not the result of a bad digital transfer, I made sure to listen to the vinyl.) The music contained on these three EPs is at times abrasive, even irritating, yet stands true to Pavements lo-fi aesthetic that was so heavily praised on its debut. It also serves to prove Smith has some merit with his frustrations as elements of the Fall are scattered all over these recordings and, at times, rather obviously. To make matters worse, the albums cover is straight from the Falls discarded artwork file. That said, after listening to these EPs repeatedly, if anyone truly has a right to cry foul, it would be Sonic Youth. In fact, early Pavement could probably best be described as the offspring of Sonic Youth and the Pixies, with the Fall and Swell Maps as the childs godparents. Think of Westing simply as the long-form birth certificate. Check Out: The Weeknd – "Initiation"